Over 30 days in November and December 2018, the Dutch member-funded journalism site raised $2.6 million for its ad-free, inclusive English language platform The Correspondent. 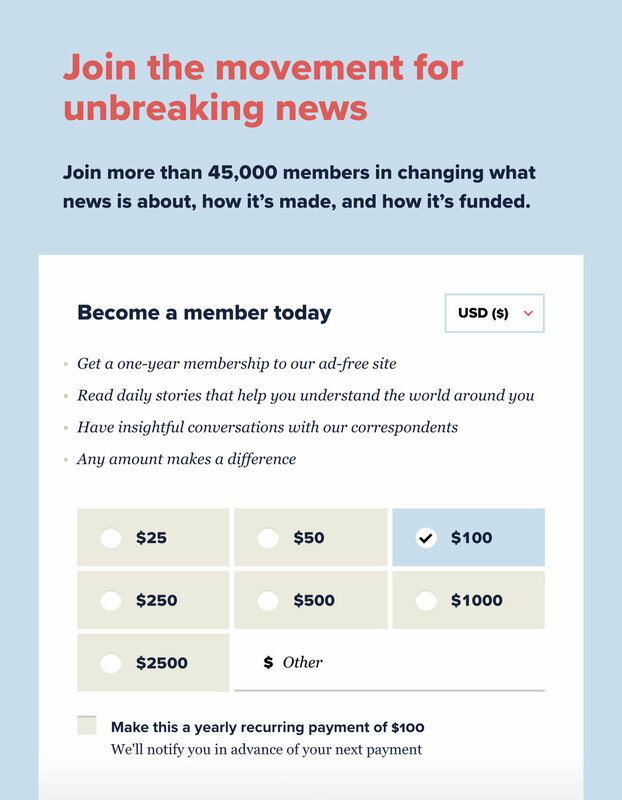 Founding members were invited to become active participants in a movement for "unbreaking news,” to change what news is about, how it's made, and how it's funded, and to contribute to a community of knowledgeable members sharing expertise from around the world. 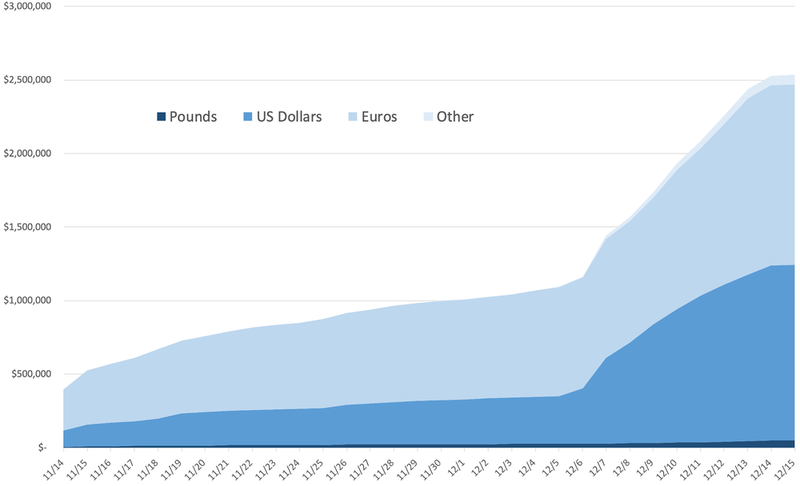 With the involvement of members from more than 130 countries, the campaign became the most participatory journalism crowdfunding project in history, a classification formerly reserved for the organization’s initial Dutch campaign in 2013. The Correspondent doesn’t have a top-notch data team or a social media team of 10. It pulled the campaign off with a team that is smaller than most American newsrooms. As the research arm of De Correspondent, the Membership Puzzle Project got a front row seat to see how their teams in Amsterdam and New York City operated. They gave themselves 30 days, knowing that they couldn’t expect more attention from potential founding members who were invited to pay what they could. These members ultimately represented people in countries so widespread that they cover about three fourths of the world. Based on our analysis of data provided by De Correspondent, more than 42,000 people gave an average of $50 each to the cause. This success reflects three years of diligent preparation; cohesive design elements; and putting people at the center. While people have frequently congratulated the team on its good luck, noting “ambassador #1” Jay Rosen’s high profile December appearance on The Daily Show, The Correspondent did not get lucky in crowdfunding $2.6MM. Almost everything in the campaign was the opposite of accidental. As Aron says, De Correspondent didn't luck its way onto The Daily Show, or into having so many prominent ambassadors, or into telling its story so effectively. Those all happened by virtue of years of planning and hard work. Crowdfunding campaigns require a huge amount of planning and management. They’re a way to test and improve upon your contract with early supporters of your work. You can help prospective supporters say “hell yes!” to the idea of backing you by offering a clear vision for what your goal is and why you need them. Even if your site is not immediately going to be in fundraising mode, there is still a lot to be learned about articulating a clear value proposition and being in close contact with supporters of your work. Following the successful crowdfunding campaign, The Correspondent team is spending January on its 2019 staffing and publishing plans. They’ll start publishing mid-2019. 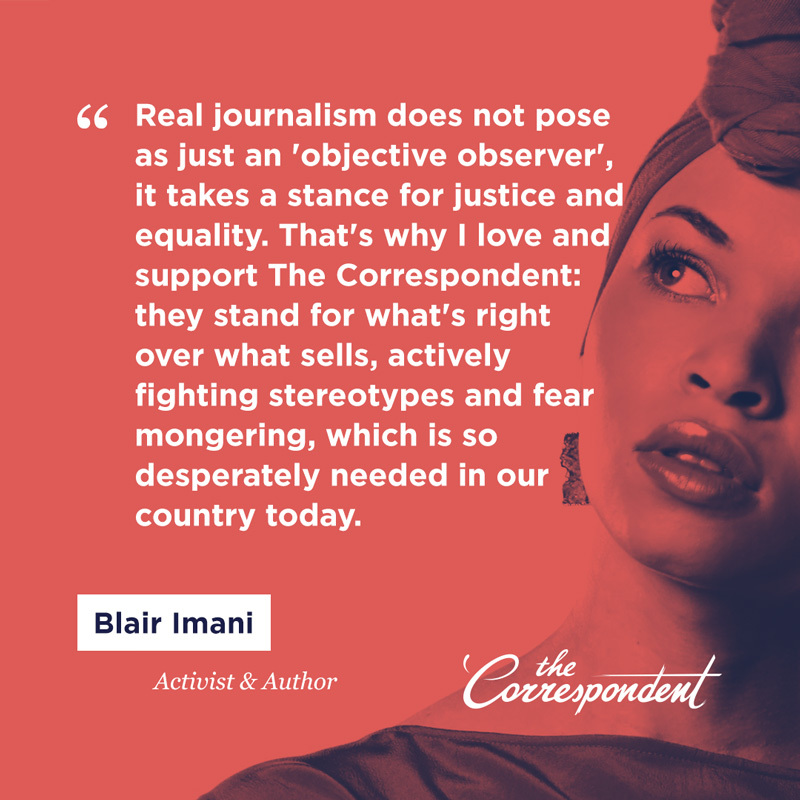 In the time between a successful crowdfunding campaign and beginning to publish, The Correspondent site reflects a celebratory vibe. To cover the cost of the campaign, the team raised $1.8 million from media funders Stichting Democratie & Media (“SDM,” a Dutch foundation that maintains veto power over any possible De Correspondent’s profit maximization attempts, however unlikely, as a built-in safeguard to protect its public service mission), Craig Newmark Philanthropies, and Omidyar Network (also a funder of the Membership Puzzle Project and now known as Luminate). This covered staff, travel, consulting from the agency Blue State Digital, Manhattan office space that was partially subsidized, materials, a large “Unbreaking News” van, and more. Some may ask if all the effort of generating $1.8 million in foundational funds to host the campaign was worth it to raise $800,000, the difference in the the $2.6 million it raised in crowdfunding. But The Correspondent is looking to generate support for a sustainable news organization in the years to come alongside individual members. Had it put the original $1.8 million funding into a newsroom directly, The Correspondent wouldn’t have brought more than 42,000 people along who want to be part of its approach. The Correspondent will be going back to founding members to opt in to renew in 2020. As Joseph Lichterman reported for Solution Set, The Correspondent is already thinking about its retention efforts for how it will convince its initial members to re-up. Money in (foundation funds) and money out (campaign costs) helped The Correspondent host its 30 day, pay what you can crowdfunding campaign. As of this publication, 47,331 people have now joined as members according to The Correspondent’s self-report. This campaign also publicly demonstrated how capital intensive it is to launch a new journalism organization. This is important because most people don’t have insight into the true costs of news reporting and distribution; those have long been obscured by advertising. This is a form of transparency that we repeatedly hear supporters of independent news value. 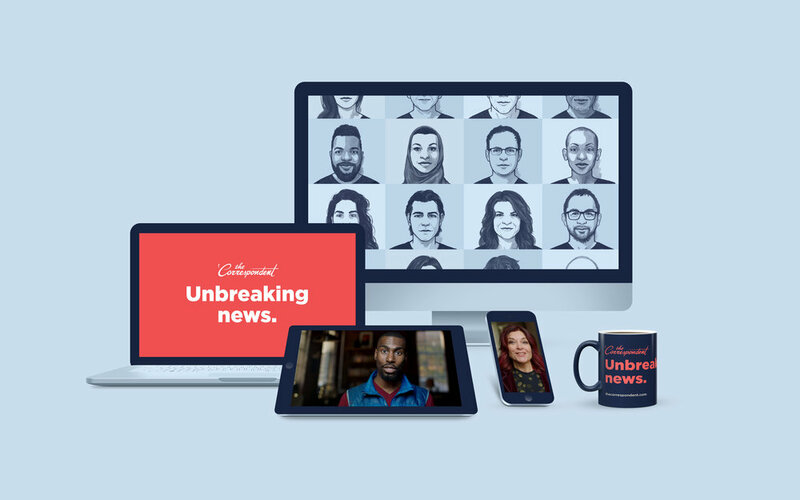 De Correspondent’s 15,500 Instagram followers saw frequent photos of a custom wrapped #unbreakingnews van, part of the movement to take “our independent, inclusive, ad-free journalism international.” Joanna Bax, a strategy intern at De Correspondent’s partner agency Momkai, developed the tagline Unbreaking News during a 2018 strategy session. The Correspondent was pitched to Dutch readers as an expansion campaign, and 19,811 Dutch people contributed to the English language campaign. Most were already members who were told they would have access to the English language site whether they contributed to the 2018 expansion campaign or not. Their decision to back The Correspondent reflected an interest in “open access and global knowledge exchange,” said co-founder and publisher Ernst Pfauth. 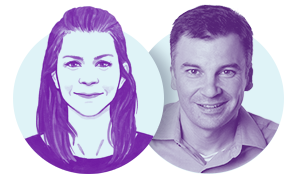 De Correspondent member campaign lead Daphne van der Kroft added, “I was amazed by how many Dutch members trust us to that extent that they believe we can add something to journalism on an international scale in another language. There was no example of what they would get, once again,” she said, referencing the 2013 crowdfunding in which prospective De Correspondent members had little to reference in the way of published journalism from the site. Engagement editor Jessica Best said that the support of an existing newsroom in Amsterdam was vital: “I had thought it will be great to have the Dutch team--but they were absolutely crucial. The emotional support [they offered] and how they mobilized the Dutch members to get this campaign off to a good start” made a major difference, said Jessica, who also edits and conducts research for this project. The founding team registered the domain TheCorrepondent.com and created the logo immediately after their successful Dutch crowdfunding. This was six years before the English site would launch...and reflects serious international ambition. 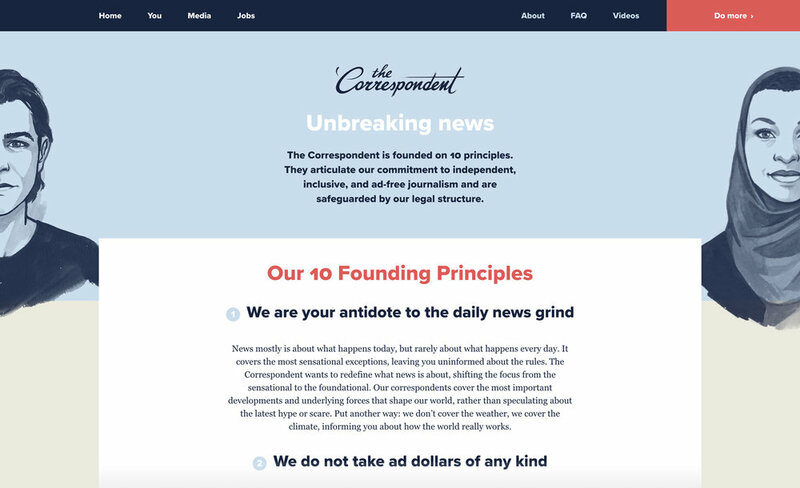 The founding team of De Correspondent introduced their colleagues to the idea of crowdfunding and launching an English language site, The Correspondent, in a May 2015 slide deck. In 2013 they’d raised $1.7 million Euros to launch De Correspondent with commenting software called Respondens. De Correspondent co-founder and creative director Harald Dunnink said the approach was “we think it through; we think it through with outside experts; we improve, improve, improve.” The team is highly detail-oriented and, according to Best, its exacting attention to design made the campaign as easy, usable, and beautiful for users as possible. Early conversations with international sites about an English language publishing collaboration fizzled, and the team recognized that they were largely on their own. Their idea was to spend a year building a network of ambassadors to demonstrate social proof. After months of planning and outreach, they fostered relationships with high-profile individuals including musician Rosanne Cash, statistician and writer Nate Silver, and other well-regarded people in their fields with their own sizable networks. Jessica said the ambassador strategy was important for gaining credibility in a new market. It came not just from a dream wish list of people who could endorse the idea (though the team did have one) but seeking out people who connected clearly with the principles. There was an element of what researchers call snowball recruiting too: The Correspondent team asked people who are bought in as ambassadors to suggest others who might connect with the concept and similarly lend it social proof. Jay brought in Rosanne Cash, who suggested David Simon as an ambassador. On the first day of the campaign ambassadors received personalized social media materials, such as activist Blair Imani’s shown here. This was low cost but high in human involvement and required months (and in some cases, years) to develop relationships that could be called on during a key period. At the news organizations where we interview supporters, even long-time members and donors usually can’t name more than one person behind the site, suggesting we can make our staff more visible--and ourselves less institutional. The Correspondent puts people--its members and staff--at the heart of its work. Starting with The Correspondent’s first full-time staff member, Zainab Shah, who joined as operations lead from BuzzFeed International, staff and ambassadors were introduced with hand-drawn avatars and encouraged to share who they are and what resonated about the approach in their own words. This felt refreshing, especially alongside a logo that was created by hand by Harald. In 2013 Ernst started writing for journalism industry aficionados on Medium and the site started translating high-interest stories into English to increase its visibility. De Correspondent created an English language newsletter in 2014. 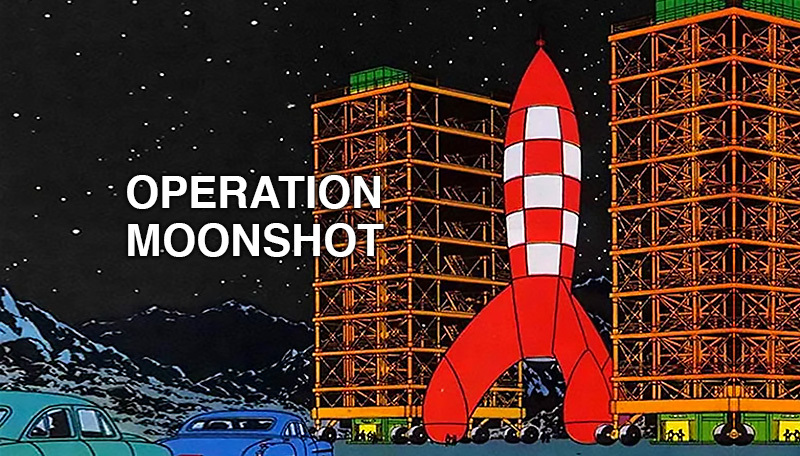 In 2017 it began partnering with this project and started sending pre-launch emails to its Dutch members. People who talked about the campaign or asked questions on social media received personal responses. This was taxing on the team, but the investment in individuals mattered. The campaign earned one $25,000 contribution, but there was no single backer who “swooped in” to help the campaign reach its goal. The median contribution was $28.50 and the smallest contribution was one Australian Dollar. An early edition of the English language newsletter in 2015 described how 40,000 members of De Correspondent was the then-equivalent of 750,000 subscribers in the US, a rate achieved by the New York Times and Wall Street Journal. The campaign wasn’t perfect, of course. 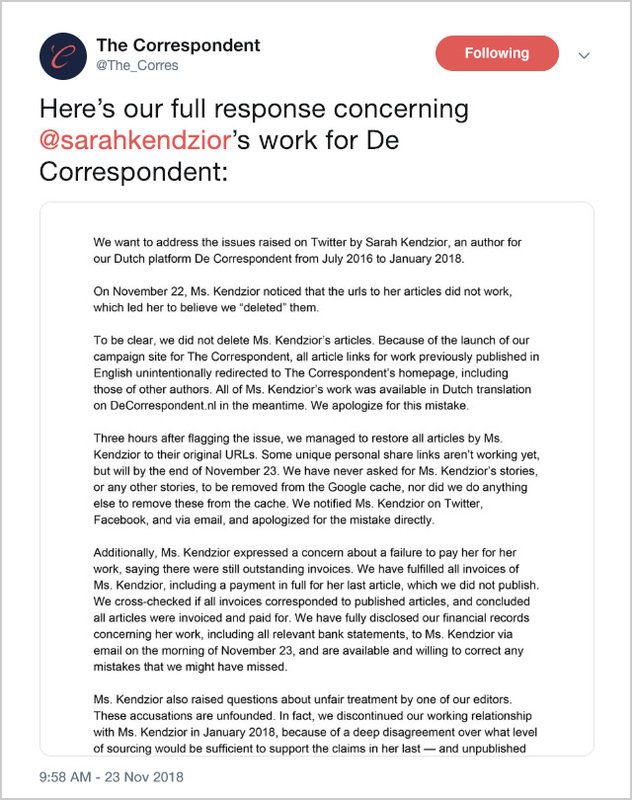 On November 22, writer and former De Correspondent freelancer Sarah Kenzior tweeted that the site had deleted her past work. The company issued a statement that 120 English language articles, including Sarah’s, had been accidentally redirected to The Correspondent homepage and reinstated them. Ernst said, “We made a stupid mistake” and that not providing access to the URLs “is something you don’t do in journalism.” A Twitter debate with many of Sarah’s more than 430,000 Twitter followers lasted three days. The middle two weeks of the campaign were arduous (which Emily can attest to, having seen the team members’ sleepless eyes during and after Thanksgiving). It wasn’t clear that the crowdfunding goal would be reached, and the campaign said it wouldn’t take any money unless the full $2.5 million goal was raised to open an English language newsroom. The team’s commitment to press outreach was arduous but important. The campaign launched on November 14: purposely timed after the US midterm elections and unexpectedly around the same time as membership announcements from Quartz, BuzzFeed News, Tortoise in the UK, and more. Even the most seasoned press person is dependent on other gatekeepers for coverage of their work. In the final week, a series of just-in-time, hard-earned television appearances by Jay on The Daily Show with Trevor Noah (which the team first pitched in February 2018, nine months before an appearance on the show) and Rob on CNN helped expand project reach. The team maintained and publicized its 10 founding principles that they had tested in the Netherlands, adapted to a different language market, and done business by. The news climate had changed dramatically since the English language project began in 2015, and they spent months refining the principles for English-speaking audiences with Jay and NYU’s Studio 20 Master’s students. Principles include “we don’t just cover the problem, but also what can be done about it.” This orientation around solutions-oriented storytelling is crucially important, and hard to demonstrate for the uninitiated. There were no existing examples of what the site would produce, because there was no reporting and production staff yet hired or members yet contributing to The Correspondent conversation. The site design and newsletters are consistently clean and non-distracting. The color palette is warm. Not having ads invites more pixel space for stories and conversation--and more headspace for readers. The team conducted A/B testing to understand what drove conversion on site but, with advising from Blue State Digital but without a data analyst on staff, wasn’t able to analyze email and social interactions as well as they might have. They were also working within a set of restrictions: one of their principles, “we protect your privacy, by minimizing the personal data we collect,” is an important point of differentiation, but means they operate without much of the information their colleagues have access to. For context, in the Netherlands, De Correspondent collects data including time on site, bounce rate, visits per visitor (according to cookies), e-commerce sales, and events like clicks on menu items and comments, all of which is tracked anonymously. Location information doesn’t get more specific than city-level, and the company uses a visitor’s full IP address to determine his or her location before stripping off the last digits and storing the address. There’s no tracking of visitors across their devices. The campaign had warm, cohesive design elements as well as three years of planning; Dutch proof; and a clear value proposition. The Correspondent diagnosed what’s not working in the field. As this project identified in studying members of independent journalism in the Netherlands and elsewhere, people want to back organizations whose coverage stands out from the news of the day: they want journalists who can help solve the problems that digital publishing has brought on and those that offer smart takes on issues with depth, integrity, and a focus that is otherwise rare. The Correspondent team took a non-competitive but honest approach: they didn’t criticize other sites or journalists, but they did talk openly about what isn’t working in the industry. Some advisors suggested that The Correspondent be more adversarial during the campaign and that picking a visible “enemy” would help its crowdfunding. Creating that tension didn’t seem on brand for an organization that aims to be constructive, Ernst said. Harald added, “Journalism is really sick [but] there’s enough pie for everyone,” Harald said. This abundance mindset is generative, inviting...and rare. In journalism, we’re still in the early days for the intersection of audience revenue and substantive engagement as publishers’ digital ad businesses continue to decline. While many sites are instituting paywalls, we hear from most supporters of news organizations that they want information and analysis to be freely available so more people can access them, not fewer. We hear that people are highly dissatisfied with most news they encounter: it feels more dramatic than actionable and doesn’t respect their privacy or attention. This call for more inclusive, interactive journalism is timely and imperative for the sustainability of the field. Members have to opt-in to make their payment recurring: a way to put the user in control. Editor’s note: An earlier headline for this story referred to The Correspondent’s campaign as the largest crowdfunded journalism project in history. El Español holds the fundraising record, and The Correspondent earned more members than any journalism crowdfunding campaign in history. Credit due to Eduardo Suárez. Thanks also to Ariel Zirulnick, Jay Rosen, Gonzalo del Peon, Ernst Pfauth, and Jessica Best for contributions to this post. Original illustrations by Lukas Kouwets. The full-time campaign team for The Correspondent was Alexa Sonnenfeld, Zainab Shah, Joris Tjaden, Jessica Best, Harald Dunnink, David van Zeggeren, Rob Wijnberg, Ernst Pfauth, Ruben Nascimento, and Martijn van Dam.